This is a very exciting time for the Think Outside the Bag campaign as it is gaining a great deal of momentum. It is moving to see the amount of positive feedback we’ve been receiving from businesses and the public alike. Recently, The Cairns Post featured an article on the beautiful window art installment by local artist Kevin Mayo, located at Community Foods. If you haven’t already seen this, please stop by and have a look at the illuminating display at 74 Shields Street. The official launch for the campaign in Port Douglas is set for April this year. 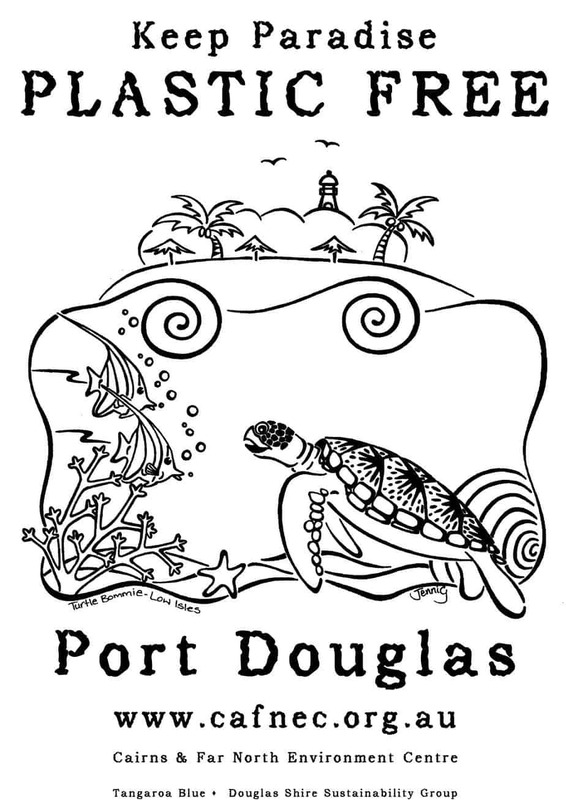 Leading up to the launch, we will be working with students at the Port Douglas State primary school to educate and then create posters that will be hung in shops around town encouraging everyone to keep paradise plastic free. Our focus has also been on finding creative ways to communicate our message and encourage public participation. Last year we ran a competition for local artists to design an image for an iconic Port Douglas reusable shopping bag. We received an excellent design from winner Jenni Fox, who created a beautiful marine design based on Low Isles. We look forward to seeing these bags hit the streets of Port Douglas soon. Another project we have in the pipeline is a short animation showing the life cycle of a plastic bag, which we’re engaging a former JCU student to create. We hope to use this to garner a larger audience through online media and television. On a state level, we are continuing to engage the Minister for Environment and Heritage Protection, Andrew Powell, to push for a Queensland-wide ban. South Australia, the Northern Territory, and the ACT have already banned single-use plastic shopping bags, and we think Queensland should be next. You too can assist putting Queensland on the map by signing our online petition at www.cafnec.org.au and help to keep paradise plastic free! to go plastic bag free at www.cafnec.org.au. Keep a spare, reusable shopping bag in your handbag or wallet, and a few in the car. Avoid using plastic shopping bags and try to minimise your use of other plastic bags, such as for weighing fruit and vegetables. Contact your local shops or supermarket to encourage them to phase out the use of plastic bags.